At-home facials are a long-standing weekly tradition for many people, who, every Sunday night, set aside time to treat their skin to clarifying, hydrating and energizing skin-care products in preparation for the beginning of a new week. And in the last couple of years, the centuries-old tradition of jade rolling, which has roots in traditional Chinese medicine and dates back to the seventh century, has become an integral part of a modern weekly ritual, as you've likely noticed on your Instagram feed. Now that we've all watched a dozen videos on how to actually use our jade rollers and mastered the technique, the latest way of incorporating crystals into DIY facials has emerged and it requires less physical work than facial rolling. Like, a lot less. Okay, fine, it actually requires complete and total stillness. (And it probably can't be done in your bathroom.) Crystal facials, like their sister practices, facial rolling and gua sha, marry the mystical practice of healing crystals with beauty and skin care, promising brighter, tighter and clearer skin. Oh, they supposedly also bring a whole list of emotional benefits, too. But rather than rolling or scraping a crystal along your skin, all you need to do is lie down while stones adorn different areas of your face and work their magic. "Crystals vibrate at different [frequencies] and help bring our faces and bodies into sync so they can glow," claims Joey Wargachuk, a crystal reader at Happy Soul in Toronto. "When you place them on different meridians, which are the different energy pressure points of the face, they literally absorb heat and release it." According to him, the heat that's being released often presents itself as tension and puffiness in specific areas of the face, which is why the placement of the crystals is important. That's where crystal facial grids come in. Crystal experts have come up with different formations of stones that can be bought in a set, along with a diagram of where to put each one. Once you've found the formation that’s right for you, all that's left to do it lie back and relax. Literally. Heather Askinosie, founder of EnergyMuse, a crystal-focused blog and e-commerce site, is well-known in the crystal community for her facial grids, which she created to address and treat different issues. "A lot of times, we show our emotional state on our faces," says Askinosie. "When we're angry, stressed out or fearful, we store that in our face. 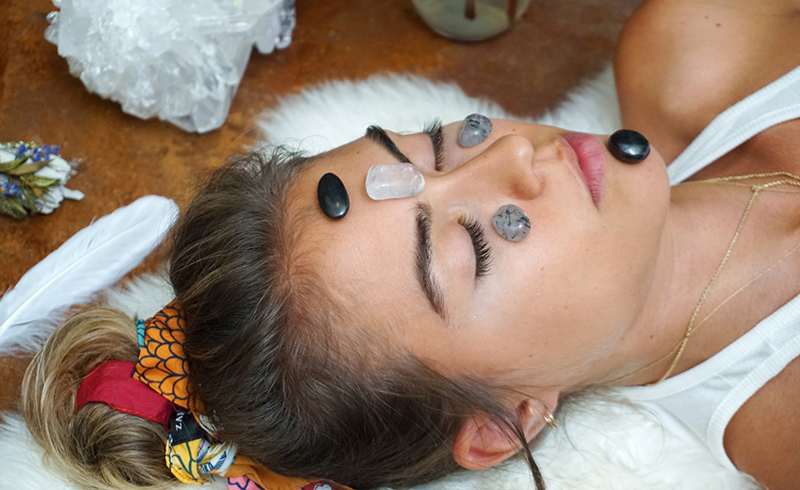 If we can use crystals on our bodies to help us release stress, [why not] on our faces?" With that in mind, she created a how-to guide outlining how to arrange crystals on your face to target specific concerns. There's even an "anti-aging" crystal facial grid, which features a lepidolite stone in between your eyebrows (for beauty), two rose quartz stones — one on your forehead and one on your chin — (for self-love), and an aquamarine stone on each cheek to encourage youthfulness. Seen as more of a meditation practice that's said to have skin-care benefits, crystal facials can, however, incorporate skin-care products. "I love to put a serum and a sheet mask on and then lay the crystals on my face for 15 minutes," says Askinosie. "It's so much more powerful; as if you have energetic hands working on you, but it's the stones." Many wellness retailers offer workshops, diagrams and/or crystal facial grid sets that will allow you to find the right crystal combination for what you're looking to address, but a mainstay in most grids is rose quartz on the chin and clear quartz on the forehead. "These are two polarized areas where a lot of tension is held," explains Wargachuk. Of course, when talking about crystals, as with any aspect of mysticism and New Age practices, there's always a bit of skepticism, but Askinosie insists, "as with any new product, it won't withstand time if it doesn't work. Crystals have been around for years and years. That's a long time for something to be around if it doesn't do anything." Wargachuk claims the science behind crystals should be enough to silence critics. The crystal facial grid he created for undereye bags and puffiness features shungite at its core, thought to be a purifying crystal. "You can add shungite to water and it absorbs the negative ions from the water. So this crystal will literally remove negative ions from your face, which helps to release tension in the muscles, [resulting in] less lines and wrinkles." On the other hand, the medical community is less apt to buy into these beliefs. "I am a proponent of evidence-based medicine, and data for crystal facials is unfortunately lacking. There have not been peer-reviewed studies demonstrating any crystal's healing powers for the body, beauty or otherwise," says Dr. Hadley King, a dermatologist in New York City. "I cannot be certain that crystals do not offer any health benefits but without data to prove otherwise and without scientific plausibility, I am skeptical." Dr. Joshua Zeichner, also a New York City-based dermatologist, shares this perspective. "There is very little true data, if any, showing that application of crystals to the skin has a real therapeutic benefit," he says. "Whether the crystals themselves offer any direct anti-aging benefits remains to be proven." However, he does cautiously note one possible benefit of crystal treatments: "We do know that the cold stones on the skin may help constrict blood vessels and can be used to enhance lymphatic drainage of excess fluid." Dr. King also points out that this type of treatment is unlikely to be detrimental to skin health, and adds one possible benefit of crystal facials: "The meditative moment of relaxation offered by the stillness of the crystal facial does sound therapeutic." Whether or not you're a believer, a couple of things are indisputable: First, that people have been using crystals on every part of their bodies for centuries, for reasons ranging from healing illnesses to promoting beauty and youthfulness. Secondly, crystals have entered the mainstream only recently, and that trend is certainly on an uptick, so if you want to get in on it, now's the time. "Our distributor had jade rollers on their list for years and never had any orders," says Wargachuk. "In the last two years they've sold 10,000, all because fashion and beauty influencers started posting about them. Now Fortune 500 companies are booking me to do crystal readings at their Christmas parties."